Learn 7 different methods for Harvesting your nutrient-rich worm poop! One of the benefits of worm composting is the worms’ poop which is very nutrient-rich compost. Vermicompost (the fancy name for worm poop) is really good for all indoor and outdoor plants and excellent to add to a vegetable garden. It will take around 6 months before you are able to harvest worm compost for the first time. After that, you will be able to harvest worm compost a little bit every month or so depending on the size of your worm compost bin and your worm herd. There are a couple different ways to harvest worm compost. 1. Handfuls – The simplest way to access your worm castings is digging down to the bottom of the worm compost bin and grabbing a handful of vermicompost. You can either add it to your garden (worms and all), or pick out the composting worms and then add it to your garden. 2. Pyramid Method – Another option is to wait until most of your worm compost bin has been converted into worm castings (they eat the worm bin bedding too) and then dump the whole bin out on a tarp on a sunny day. Form a couple small pyramids of worm castings and the worms will burrow into the pyramid because they don’t like the light. Then, carefully brush worm castings off of the outside of the pyramid and set aside. The worms will burrow again. Repeat until almost all worm castings are harvested and you are left with a ball of worms. Refill your bin with fresh worm compost bin bedding and add your composting worms back to the bin. 3. Side to Side Migration Method – Wait until all your bedding has been processed into vermicompost. Then, pull it all to one side of your worm compost bin leaving the other side open. Fill the open side with fresh worm bin bedding and begin feeding your worms only on that side. Over the course of a couple weeks most of your worms will take the hint and move to the new side and you can pull finished worm compost from the other. 4. Screen and Light Method – Take advantage of the fact that worms don’t like the light and will move away from it to harvest worm compost. Pull several handfuls of vermicompost out from the bottom of your worm compost bin and spread thinly on a piece of window screen or very fine hardware cloth. Then, put the window screen or hardware cloth on top of your open bin so that it is resting on the bedding. Shine a light on the vermicomposting bin or leave outside on a sunny day and the worms in the vermicompost will move away from the light, down through the screen, and back into their worm compost bin. Wait a couple hours for the worms to move and then simply lift the screen off and use the worm castings. 5. Corralling Methods – You are a worm rancher, why not set up a corral? Use an old onion or potato bag that has many holes in it (burlap also works well). Fill The bag (the worm corral) with some fresh bedding and some of their favorite food. Tie the bag shut and burry or place it in your worm compost bin. Be sure the worms don’t have any other food in their bin except for in the worm corral bag. Wait a couple weeks for the worms to get inside the bag and then simply lift out your worm corral and use your worm castings. 6. Cylinder Spinning Harvester – If you have a lot of worm compost to process you may want to consider building or buying a worm compost harvester that is designed to separate the worms from the worm compost. Check out the below video of me using one that I built. The cylinder is made from 1/4 inch hardware cloth. Handfuls of worm compost + worms go in the top. As it spins, the small chunks of worm castings fall through the screen while the large chunks and the worms come out the back. It works decently but it is certainly not perfect. 7. Flow Through Bin – My favorite way to harvest worm compost is to use a bin that helps! 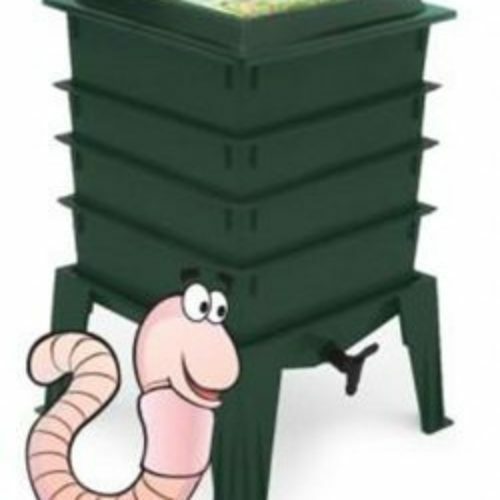 Build or buy yourself a continuous flow through worm bin and harvesting is much easier. Flow through worm bins usually have some sort of grate holding the bedding up and are open underneath for harvesting. Composting worms move upwards as they eat leaving the worm castings behind. The very bottom should not have many worms in it. Castings either fall through the grate on their own because of the worms movement or you can use a hand cultivator to agitate and knock it through. The Worm Wigwam (more info or purchase here) even has a harvest crank attached to a blade that sits on top of the grate and scrapes off the bottom layer of worm compost.